Indian Head half eagles were issued annually from 1908 through 1929. The series ended in 1929-one of many victims of that year's Wall Street crash. As the depression took hold, what little gold came into the Mint was used for production of double eagles. 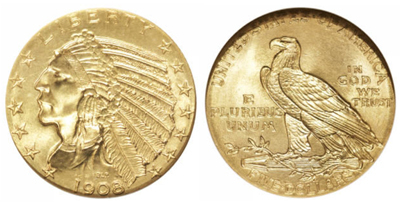 With the cessation of gold coinage and the great recall of 1934, the half eagle would not return. Being recessed, the design elements on Indian Head half eagles are protected from excessive wear. At the same time, this complicates the grading of these coins, since the patterns of normal wear differ from those of raised-relief coins. Critical areas for detecting traces of wear are the Indian's cheekbone and headdress feathers and the shoulder of the eagle's left wing. Counterfeits of many dates exist, and some are very deceiving. Any questionable piece should be authenticated.